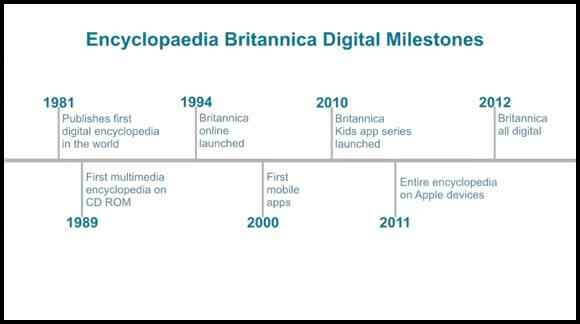 After 244 years, Encyclopedia Britannica is doing away with its printed volumes in favor of its digital database. The digital age has claimed yet another victim. Citing the fact that most of their users already utilize their digital version, Encyclopaedia Britannica is doing away with print. It marks the end of a reference that was the oldest English language encyclopedia still in print. Sales of the bound volumes has been in decline for the past three decades. After peaking in 1990, when 120,000 sets were sold in the US, digital reference tools like Encarta and the rise of the Internet began to phase out the encyclopedia. With a price tag of $1,395, the volumes are primarily bought by schools, libraries and research institutions. The last set to be sold, the 2010 edition, only found 8,000 customers. But if you have some extra cash and want a 129 pound keepsake, 4,000 sets are currently sitting in a warehouse waiting to be sold. Ending the print edition isn’t such a drastic change for Britannica. Less than 1 percent of their revenue comes from the printed volumes. The bulk of their revenue, 85 percent, comes from curriculum materials like educational films and tools to learn English as a second language. Another 15 percent comes from subscriptions to the encyclopedia’s online version. There are about half a million subscriptions to the online version. 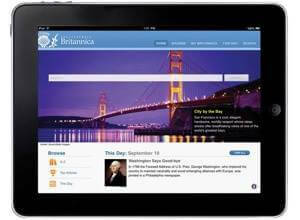 For $70 a year, subscribers get access to Britannica’s articles, videos, and to mobile applications. The print version’s denise is due in no small part to Wikipedia. Since it was created 11 years ago the online – and free – encyclopedia has amassed about four million articles in English covering everything from the constellations to celebrities. With tens of thousands of contributors, Wikipedia has a breadth of subject matter that Britannica, with just over 4,000 contributors, can’t compete with. But the company argues that it’s about quality, not quantity, saying their expert contributors – which include Nobel laureates and golf legends like Arnold Palmer – make for a much more reliable database. You might recall, however, the Nature study that pitted Encyclopedia Britannica and Wikipedia in an accuracy contest. Britannica won, but just barely. While Wikipedia showed an average of four errors per article, Britannica had three. Not what you might expect from the world’s foremost encyclopedic source. Britannica didn’t expect it either and disputed the findings, saying that the study was wrought with errors, “completely without merit,” and demanded its retraction. Their main beef was that the errors identified by Nature’s 42 expert reviewers were not double-checked and in fact were not errors at all. Nature responded, saying that their reviewers were blinded as to which publication each article originated from and thus any mistakenly identified errors would not have affected the study either way. The end of their printed volumes, understandably sad to many, is probably a surprise to no one in a digital age when Kindle books are outselling Amazon’s print books and libraries themselves are replacing bookshelves with computer stations. Perhaps ahead of the curve, according to a company blog they’d actually created the first digital encyclopedia for LexisNexis back in 1981! Of course, an obvious advantage to a digital encyclopedia is the opportunity for continual updates and revisions. Remember all those supplementary books they’d send, with the stickers you’d have to place on the updated articles? Remember all the bookshelves they ate up? Encyclopedia Britannica isn’t just the encyclopedia you grew up with, but has been a major source for knowledge since its first publication in Edinburgh, Scotland back in 1768. I’m with those people who are a bit saddened by the prospect of visiting a library and not seeing those rows of regal encyclopedia volumes. There’s something soothing about it. Come to think of it, when was the last time I visited a library? I mean, why would I? Everything’s online.